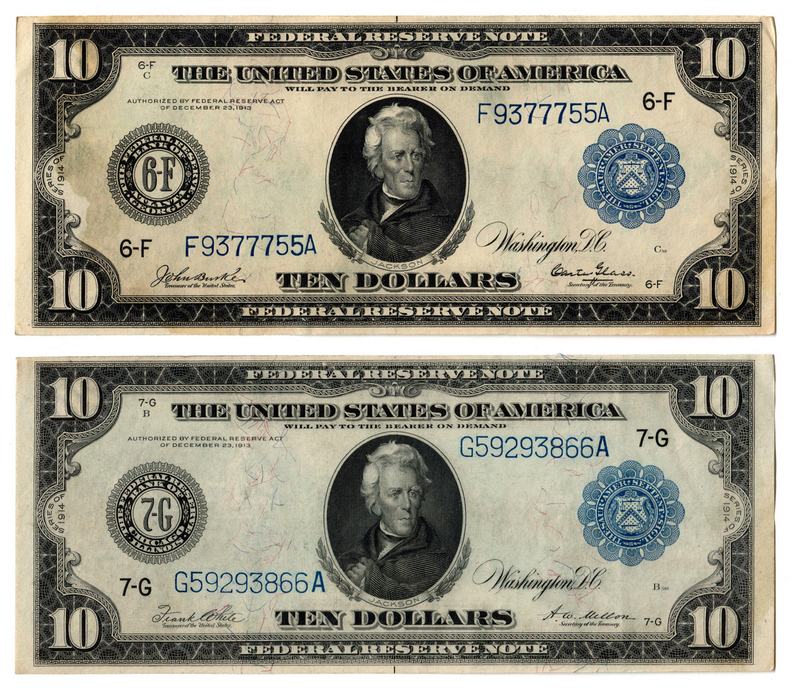 Two (2) 1914 US $10 Blue Seal Federal Reserve notes, depicting the portrait of President Andrew Jackson, engraved by Alfred Sealey (New York, 1815-1868) after a painting by Thomas Sully (Pennsylvania/England, 1783-1872). 1st item: Serial # G59293866A/ pp B. FR # 931B. White/Mellon signatures. 2nd item: Serial # F9377755A/ pp C. FR # 925. Burke/Glass signatures. Provenance: the collection of the late James A. Newman (Nashville, TN, 1892-1964). CONDITION: 1st item: Extremely Fine/Uncirculated condition. 2nd item: Fine condition, dampstaining, left side of note.